The brown marmorated stink bug (BMSB), an insect not previously seen on our continent, has now been found in Massachusetts and at least 22 other states. This true bug in the insect family Pentatomidae is known as an agricultural pest in its native range of China, Japan, Korea and Taiwan. It was first observed in the US Allentown PA in 1998 and since then has become a serious pest of fruit, vegetables and farm crops in the Mid-Atlantic region. It is probable that it will become a pest of these commodities in other areas in the United States. The adult BMSB has a shield-shaped body (a trait of most stink bugs). It is about 3/4 inch (14-17 mm) long, 3/8 inch (8 mm) wide, and mottled or marbled grey-brown in color. Its underside is white, sometimes with grey or black markings, and the legs are brown with faint white banding. One way to distinguish a BMSB from other stink bug species commonly found in Massachusetts is by the alternating dark and light bands on the insect’s last two antennae segments as well as darker bands on the membranous, overlapping part at the rear of the front pair of wings. They have patches of coppery or bluish-metallic colored puntures (small rounded depressions) on the head and pronotum. 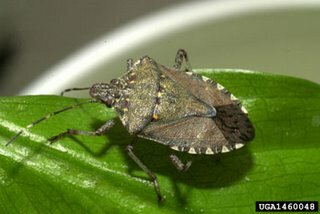 The name “stink bug” refers to the scent glands located on the dorsal surface of the abdomen and the underside of the thorax. BMSB is also commonly confused with the Western Conifer Seed Bug, another insect which often invades homes in the fall looking for a place to overwinter. The eggs are elliptical (1.6 x 1.3 mm), light yellow to yellow-red with minute spines forming fine lines. They are attached, side-by-side, to the underside of leaves in masses of 20 to 30 eggs. There are five nymphal instars (immature stages). They range in size from the first instar at 2.4 mm to the fifth instar that is 12 mm in length. The eyes are a deep red. 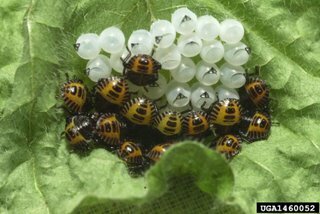 The abdomen is a yellowish red in the first instar and progresses to off-white with reddish spots in the fifth instar. Protuberances are found before each of the abdominal scent glands on the dorsal surface. The legs, head and thorax are black. Spines are located on the femur, before each eye, and several on the lateral margins of the thorax. Please visit the UMass Extension Fruit Advisor's BMSB Identification Page for more information and photos. This species probably has a single generation per year in Massachusetts depending on the temperatures. However, in parts of sub-tropical China, records indicate from four to possibly six generations per year. Adults will emerge sometime in the spring of the year (late April to mid-May), and mate and deposit eggs from May through August. The eggs hatch into small black and red nymphs that go through five molts. Adults begin to search for overwintering sites starting in September through the first half of October. In its native range, it feeds on a wide variety of host plants. In the United States, BMSB damage has been reported on vegetable crops such as sweet corn, tomatoes, lima beans and green peppers. It is likely that the list of affected crops will grow as this pest spreads and populations become established in new areas. Fruits attacked include apples, peaches, figs, mulberries, citrus fruits and persimmons. This true bug has also been reported on many ornamental plants, weeds, soybeans and beans for human consumption. Feeding on fruits and vegetables results in scarring, cat-facing, and spotting of developing fruits and vegetables, reducing marketability. Crop damage can be significant. The MA Dept of Ag Resources is interested in collecting early-season detections of BMSB. If you suspect you have found BMSP, please submit a report to Massachusetts Introduced Pests Outreach Project at massnrc.org/pests/report.aspx. The UMass Extension Vegetable & Fruit Programs have traps up at a number of farms across the state and will report any significant captures. For current information on production methods (including varieties, spacing, seeding, and fertility), weed, disease, and insect management, please visit the New England Vegetable Management Guide website. More specific reccomendations for this invasive pest can be found at the UMass Extension Fruit Advisor's website.